Loader Lift Capacity - 2,178 lbs. 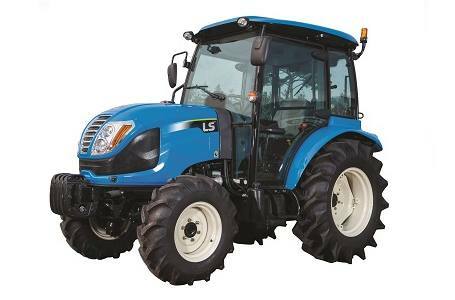 Modern Stylish Design - This compact 4WD is ergonomically designed and stylish with its distinctive blue color. LS Tier 4 Engine - 3 Cyl. In-line, Water-cooled 4cycle Turbo diesel, CRDI. Meets EPA’s most stringent emission standards while delivering rated horsepower quietly with low vibration. Easy Open One-Piece Hood - provides accessibility for easy maintenance. Large Fuel Tank – 10.6 gallon capacity provides long operation times between fill ups. Hydrostatic Transmission - maximizes ease of use with effortless, clutch-less and instant speed and directional changes with a simple push of the pedals. PTO Switches - select manual or independent PTO and turn on or off with a simple turn of switch. Simple Selections - select your range with simple move of the lever. 3-point Hitch with Telescopic Lower Links Standard - category 1 with a hitch lift capacity up 2756 for XR4046C models lbs. allows easier attachment of a wide variety of implements. Drawbar Standard – increases the usefulness of the tractor without the additional optional cost. Extendable lower links-makes connecting implements easier. Ergonomically Designed 3-Point Hitch Controls and Fender Mounted Joystick - easily accessible for maximum comfort and convenience. Position and Draft Control - increases ease of use across a wider variety of implements. Easy to reach fender mounted front end loader joystick. Deluxe Adjustable Seat with Seat Belt - keeps you in a comfortable even during long operations. Standard Foldable ROPS (Open Station Models) - allows storage in low clearance buildings or sheds. Flat Platform – with rubber mat, maximizes space, improves operator comfort, and makes getting on/off tractor easier. Comfortable Cab (Cab Models)- offers roomy, unobstructed view in AC/heated comfort and includes interior lighting, front wiper/washer and side mounted mirrors. Full Function Dash Panel - important functional data is available at glance for optimum performance and control. Hydrostatic Power Steering with Tilt – makes turning easier, improves control and reduces fatigue and enhances comfort. Greater Steering Angle - improves handling with tighter turning radius. 2 Sets of Remotes and Detent Function Standard - adds functionality and improves ease of use by allowing attachment of hydraulically controlled implements without the high, additional costs like others in its class to add the remotes as options. Your Choice of Tires - choose industrial, Ag, or turf tires at no additional cost; subject to dealer inventory. Optional Quick Attach, Skid Steer Compatible Front End Loader - remove or attach in moments. With 2178 lbs. of lift capacity for XR3100, it outperforms others in its class. Grill guard comes standard with loader rather than an option like others in its class. Optional Quick Attach Backhoe - remove or attach in seconds. With 89” digging depth, 2,673 lbs. of digging force and 180° swing arc, it outperforms other in its class. Overall length, Bumper to Link in. : 124.3"
Min. overall width with Ag tires: 60"
Height to top of CAB with Ag tires: 88.1"